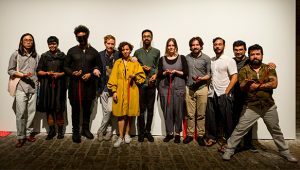 In a ceremony held on the evening of October 8 at the Sesc Pompeia Theater, the 20th Contemporary Art Festival Sesc_Videobrasil gave out three acquisition awards for video works, a special prize money award and five artist residency awards. 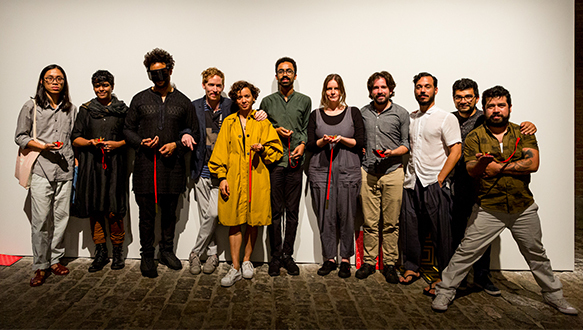 The awards, which aim to acknowledge and encourage the development of artists producing compelling work, regardless of their idioms and means, were granted by the jury formed by invited curators and representatives of the residency programs. The jury members were: Ika Sienkiewicz-Nowacka (Greece/Poland), Jennifer Lange (USA), Katharina von Ruckteschell-Katte (Germany), Lisette Lagnado (Congo/Brazil), Mami Katsuya (Japan), Maria Catarina Duncan (Brazil), Marina Fokidis (Greece), Pablo León de la Barra (Mexico) and Salah M. Hassan (Sudan/USA). The trophy sculpture for this edition was created by the Brazilian artist Flávia Ribeiro. Deliberately avoiding the grandiose tone commonly imparted to objects in this category, Ribeiro conceived a palm-sized bronze bird which simultaneously evokes ideas of delicacy and freedom, flight and welcome. The reduced dimensions, the gold and the velvet convey the feeling of a small and subtly precious gesture, which the artist relates to the generosity present in both the work of art and the gaze that welcomes, distinguishes and rewards. Quy Minh Truong, work Vuon Bau Xanh Tuoi (2016, video). O.F.F. Award. Prize money of R$ 25,000 granted by the Ostrovsky Family Fund (USA, Israel, Brazil) a Jaime Lauriano. Artist residency awards. Five artists were awarded and will take part in two-month residency programs in 2018-2019, with airfare, accommodation and per diem included. La Decanatura: Pro Helvetia (Switzerland). Honorable mention to Andrés Padilla Domene, for the work Ciudad Maya (2016, video).